When our weather turned chilly last fall, I made a vow to use my slow cooker more often until spring arrived. Not that our fair weather months don’t warrant the use of the slow cooker, but once the snow melts and the warmer temperatures come around, we are all about grilling. It’s almost a daily affair. And right now I’m missing it so much! Blake was doing a great job at keeping a path through the snow to our grills for most of the winter, but then we just kept getting hit over and over again with snow. And there just isn’t enough time or energy in the day to keep up with it when the snowfall is on constant repeat and there are kids and jobs and everything else to attend to. Needless to say, we lost the battle. So now we’re just waiting for some warmer temps to shrink away all this snow. In the meantime, I’ll just keep experimenting with new slow cooker recipes. 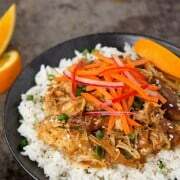 This Slow Cooker Orange Chicken with Fresh Asian Slaw has quickly become a favorite around here. And be sure to check back next week when I share a recipe that you’ve all been waiting for…a slow cooker version of that awesome lasagna soup. 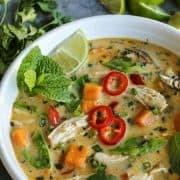 It’s been such a popular recipe, and I’ve received so many requests for a slow cooker version. So I incorporated not only the use of a slow cooker, but also a number of other things you’ve been asking for. It’s as wonderful as the original! If you find most orange chicken dishes at restaurants to be cloyingly sweet and almost fake in their orange flavor…and if you try to stay away from fried versions of orange chicken…then I have a treat for you! 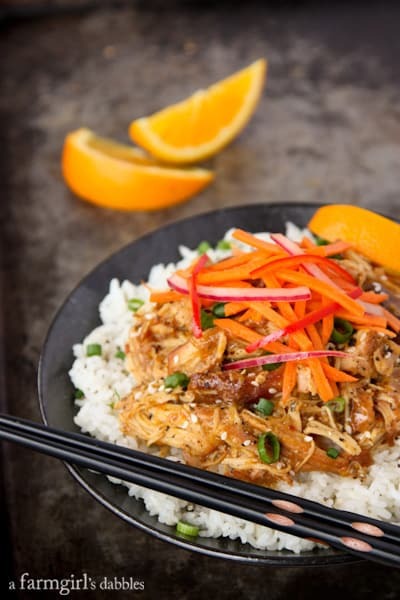 I love the fact that this dish of orange chicken comes together in a slow cooker. And that I can get that wonderfully warm and bright citrus flavor that I’m craving, and it actually tastes like orange! I am one of those people who tries to avoid fried foods (although I definitely have moments of indulgence here and there), so that part is also a plus for me. The recipe calls for a combination of both white and dark chicken and is topped with a simple optional fresh veggie slaw, packing in extra flavor. It’s the perfect meal solution when the path to your grills is piled high with snow! Place chicken thighs and breast pieces in the slow cooker. In a medium bowl, stir together the marmalade, 1/2 cup of the orange juice, the zest from 2 oranges, soy sauce, stir fry sauce, olive oil, sesame oil, onion, garlic, ginger, and red pepper flakes. Pour over the chicken and gently combine to coat the chicken. Cover the slow cooker and cook on low for 4 to 5 hours, stirring a couple times to incorporate. Use a tongs or large spoon to remove the chicken pieces from the slow cooker to a cutting board. With two forks, shred the chicken into bite size pieces. The chicken should be very tender. Transfer the liquid from the slow cooker into a medium saucepan over medium-high heat. Return the shredded chicken to the warm slow cooker. Bring liquid in saucepan to a boil. In a small bowl, whisk together the remaining 1/4 cup of orange juice with the cornstarch, and then whisk the orange slurry into the boiling liquid. Cook until the liquid reduces a bit and thickens, about 3 to 5 minutes. Stir in the remaining orange zest and then pour sauce over the chicken in the slow cooker, stirring to combine. Serve orange chicken over rice with sliced green onions, sesame seeds, fresh orange wedges for squeezing over the top, and fresh Asian slaw. A couple grindings of black pepper are lovely, too. In a medium bowl, whisk together rice wine vinegar, lime juice, honey, soy sauce, sesame oil, ginger, and garlic. Add thinly sliced mix of vegetables and toss to combine. 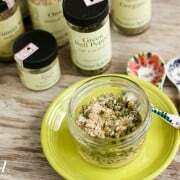 This can be made a day ahead of time, stored in the refrigerator, and is actually better when the flavors have a chance to mingle for at least a few hours before eating. I like the contrast of crunchy tangy vegetables in this slaw with the sweet and tender orange chicken. But this slaw is completely optional, and the orange chicken is perfectly wonderful without it. I enjoy your blog. 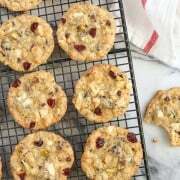 I have tried to print many of your recipes but there is always an ad someplace in the recipe so I can not read the ingredient list. How do I get rid of the ads? I have a daughter in law who craves orange chicken. I crave Asian slaw. I think this may be a match made in heaven to quote an overused metaphor. Also since I am a working woman, the slow cooker is my very very dear friend. It’s like you’re reading my mind Brenda – orange chicken is my kryptonite! Ben is going to flip for this – I might have to make this for our busy week! I love slow cooker recipes! This asian bowl looks amazing! This looks wonderful! I love orange chicken and that Asian slaw looks perfect! Brenda- I bet this is such a fantastic meal to bridge the cap between winter and spring. I love orange chicken and I love the slow-cooker angle! Has anyone else had trouble printing the Orange Chicken recipe? Twice my printing comes out like gobble degook. Looks delicious Brenda! Love orange chicken. I’m not sure I’ll know how to act next week, we’ve had it so cold and snowy all season long. Giddy, for sure! Hope you’re doing well – have a great weekend! Love this! What a great family meal. What a fantastic meal, so bright and delicious! Thank you so much, Gaby. Happy Weekend to you! I’m such a fan of slow cook dishes and my teenagers love, orange chicken. This dish is perfect for my busy life and it looks gorgeous! Thank you so much, Maria. Hope your family likes this, too! Is there an easy substitute for the hoisin sauce/Trader Joe’s sauce? I don’t love hoisin sauce and don’t want to make a special trip to Trader Joe’s. Hi Kelly! How about a sweet chili sauce or a sweet jalapeno jelly…any kind of sauce that has a sweet and spicy combo. I could even see some kind of bbq sauce. Wow, this is a gorgeous meal! I just found out that I have a slow cooker in my house, so I’m dying to take it out and give some recipes a try. Have fun! There are so many great meals for the slow cooker. Looks fantastic, Brenda. Orange chicken is one of my favorite entrees! Ever! I made myself the same slow cooker promise, and still need to use it a few more times to make good. Love homemade versions of restaurant dishes like this! It’s been fun using it more, for sure. So wonderful to have all the cozy meals during this crazy winter of low temps and high snowfall! 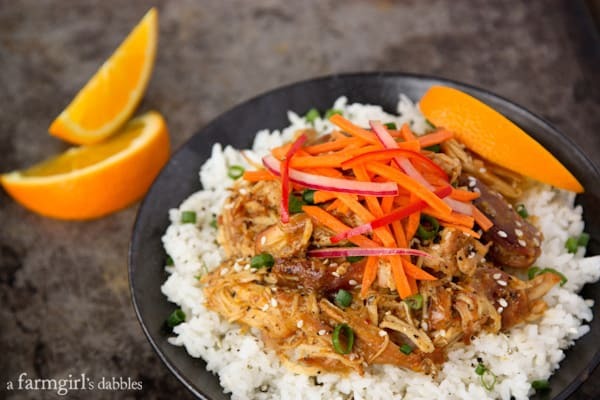 My husband loves Asian flavors and I love the convenience of using my slow cooker… so this recipe is a win! Pinning to try soon…. PS ~ We normally grill year round. This winter? NotSoMuch! Cannot wait to grill again too. Spring is coming soon Friend. I’ll hold you to that, Kim. I’m really craving getting back outside for walks and opening up the windows! Have a great weekend! This is the perfect meal, Brenda! One that everyone will love, is easy to make and healthy too! Also, I hate frying so this is perfect! Oh and that slaw sounds delicious! Thanks, Tieghan! I do love fried foods, but don’t like doing it in my own kitchen, either…takes days for that smell to leave!